Dissolve jello in 1 c. boiling water. Add 1/2 c. cold water. Let it set in fridge for 20 minutes. With mixer or whisk, add dry vanilla pudding mix and beat until smooth. 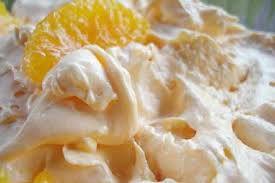 Fold in oranges and whipped topping. Refrigerate until ready to serve.